Stephen Colbert dedicated a portion of his “Late Show” with a humorous take on a recent scientific report about how drugs are passing through people’s bodies and ending up in Puget Sound, where they can affect fish, including salmon. This video has been viewed about 216,000 times since it was posted last Tuesday. In the four-minute video, Colbert goes on to have a conversation with Sammy the Salmon, who seems clearly affected by the drugs he has been consuming. On the serious side, you can read about the study from the National Oceanic and Atmospheric Administration in a Kitsap Sun story by reporter Tristan Baurick. Tristan’s story inspired me to write a “Water Ways” post about one possible solution being studied: building enhanced treatment processes into existing wastewater plants. In other humorous news, perhaps you’ve seen the new SeaWorld commercial called “The new future of SeaWorld.” The ad promotes SeaWorld’s decision to quit breeding killer whales and to halt its theatrical shows with orcas but not to move them out of their tanks. Recall Water Ways, March 17. PETA, People for the Ethical Treatment of Animals, quickly posted a parody that you can watch in the second video player on this page. I’ve added links for three previous reports related to the degradation of pharmaceuticals and personal care products. Concerns are growing about medications and person-care products that pass through sewage-treatment plants and into Puget Sound, where the chemicals can alter the physiology and behavior of fish and other organisms. Almost everywhere scientists have looked, they have found drugs that people have either flushed down the drain or passed through their bodies. Either way, many active pharmaceutical compounds are ending up in the sewage at low levels. Conventional sewage-treatment plants can break down up to 90 percent or more of some compounds, but others pass through unaltered. Now, researchers are working on a process that would use specialized bacteria to break down pharmaceutical compounds at existing sewage-treatment plants. 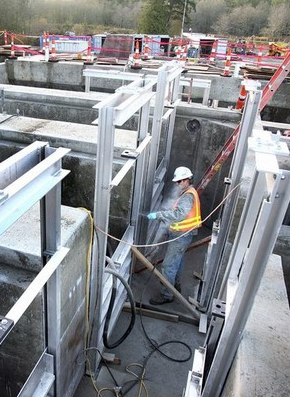 The idea, developed by researchers at the University of Washington, is ready for a limited pilot project at one of the treatment plants in the Puget Sound region. Heidi Gough, left, and Nicolette Zhou with a table-top sewage-treatment plant in the lab. Studies into this issue began more than 20 years ago, when it became clear that all sorts of compounds were passing through sewage-treatment plants and getting into the environment. Among the early findings was that male fish exposed to artificial birth-control hormones were changing into female fish. Later studies showed that common antidepressant medications seemed to be changing the behavior of fish, making them easier targets for predators. In addition to estrogens and antidepressants, researchers have found blood thinners, cholesterol-reducing drugs, various heart medications, several hormones and painkillers, along with caffeine, cocaine and various cosmetic and cleansing chemicals. 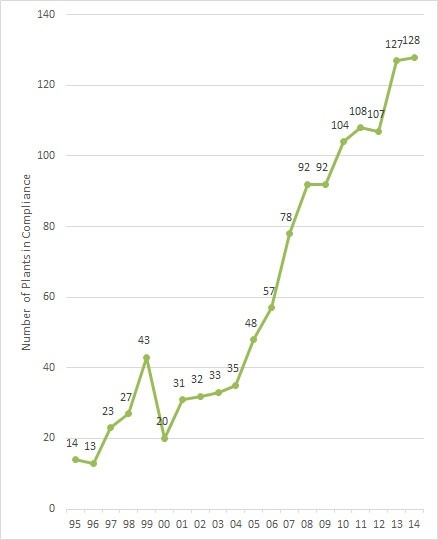 A study funded by the Environmental Protection Agency looked for 56 active pharmaceutical compounds in sewage effluent from 50 major treatment plants around the country, finding significant levels of many compounds. A new study by NOAA’s Northwest Fisheries Science Center and the University of Washington looked at 150 compounds coming from two sewage treatment plants in Puget Sound. They were Bremerton’s plant on Sinclair Inlet and Tacoma’s plant on Commencement Bay. They also tested the local waters along with juvenile chinook salmon and Pacific staghorn sculpin to see if the fish were picking up the compounds. According to a NOAA news release, the study “found some of the nation’s highest concentrations of these chemical compounds and detected many in fish at concentrations that may affect their growth or behavior.” For additional reporting on that study, check out the Kitsap Sun story by Tristan Baurick and the Seattle Times story by Lynda Mapes. These chemicals could be having effects on various animals in the food web — from benthic organisms that live in the sediments to marine mammals — but more study is needed. Complicating the situation is that multiple pharmaceutical chemicals may work together to create different effects, depending on their concentrations and the affected organism. Many people would argue that we have enough information to dramatically increase our efforts to remove these compounds from wastewater going into Puget Sound. Drug take-back programs have been started in many cities and counties throughout Puget Sound to encourage people not to flush unused pills down the toilet or drain. See the Take Back Your Meds website. Still, Washington state has yet to develop a comprehensive statewide program that would cover everyone. Meanwhile, nobody can say what percentage of the drugs going into the treatment plants were dumped down the drain versus being excreted from the human body. But it wouldn’t matter as much if the chemicals could be eliminated at the sewage-treatment plant. More than a decade ago, Heidi Gough of the UW’s Department of Civil & Environmental Engineering began working on the development of bacteria that could break down these chemicals of concern. She and her colleagues have isolated cultures of bacteria that can break down triclosan, an antimicrobial; bisphenol A, a plasticizer; ibuprofen, an anti-inflammatory drug; 17β-estradiol, a natural hormone; and gemifibrozil, a cholesterol-lowering drug. The process of isolating helpful bacteria and boosting their numbers could theoretically be used to break down almost any chemical of concern. To be suitable, the bacteria must 1) break down the target chemical to a very low level, 2) grow well in common growth media without the target chemical, 3) break down the chemical even when other nutrient sources are abundant, and 4) work quickly within the normal rate of sewage treatment. 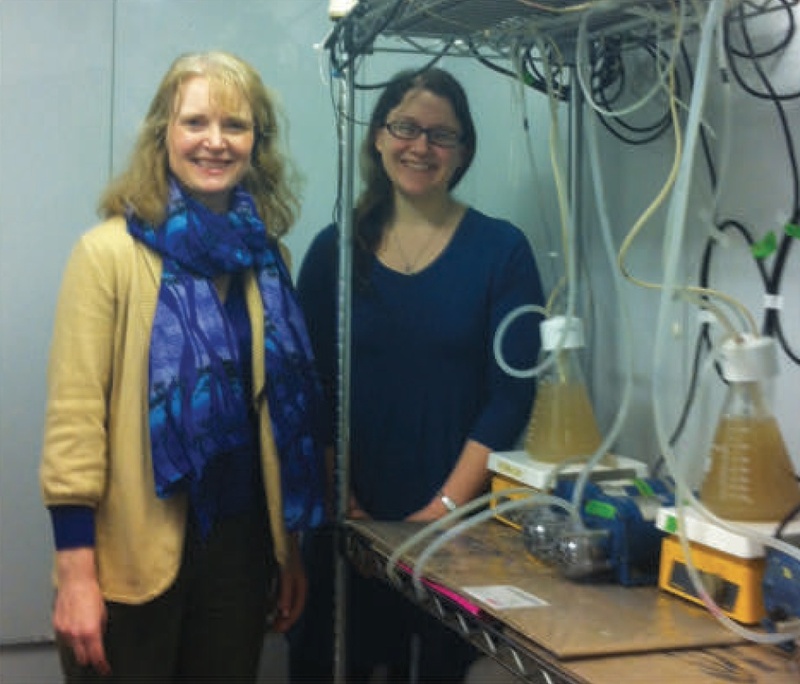 Nicolette Zhou, a former UW graduate student, worked with Heidi to successfully develop a bench-top treatment plant to test the process. Nicolette also produced a computer model of how the operation would perform at a large-scale treatment plant. She completed her analysis and received her doctorate degree last fall. Her latest findings are now awaiting publication in a scientific journal. Genes involved in Bisphenol A degradation, Environmental Science and Technology. Degradation of triclosan and bisphenol A by five bacteria, Pub Med. Cultivation and characterization of bacteria capable of degrading pharmaceutical and personal care products, Pub Med. Other systems have been proposed for breaking down complex pharmaceuticals, such as advanced oxidation or other chemical or physical treatment. But biological breakdown offers the most hope in the short term, because it is how most sewage-treatment plants work can be implemented quickly without major modifications and appears to be economical on a large scale, Nocolette told me. In a large-scale system, the first step would be to identify the specific contaminants to be reduced and then select the bacteria. Some bacteria will break down multiple chemicals, she said. The bacteria would be grown in a tank and be fed into the sewage digesters reactors, preferably in a continual flow. Multiple chemicals of concern might require several tanks for growing different bactieria. If the process is successful and adopted by many treatment plants, an alternative process could be developed. Instead of growing the bacteria onsite, where conditions could be difficult to control, all sorts of bacteria could be grown in an industrial facility. The industrial plant would isolate the actual enzymes needed to break down the chemicals and ship them to the treatment plants. The enzymes could be stored and fed into the treatment process as needed. The research into this treatment process has progressed to where the next step is a small-scale pilot project at a sewage-treatment plant in the Puget Sound area, Nicolette said. A portion of the actual wastewater would be diverted to the pilot plant, where sewage would be subjected to the specialized bacteria and tested for the level of treatment. Ultimately, more studies are needed to establish a safe concentration for the various chemicals that come from pharmaceuticals and personal-care products. That way, one could culture the appropriate bacteria and establish a reasonable effluent limit for chemicals going into Puget Sound. 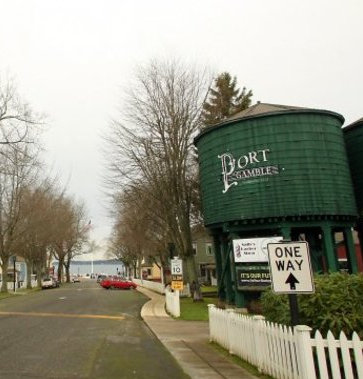 The historic town of Port Gamble is about to get a new-fangled sewage-treatment plant, one that will allow highly treated effluent to recharge the groundwater in North Kitsap. The old treatment plant discharges its effluent into Hood Canal, causing the closure of about 90 acres of shellfish beds. After the new plant is in operation, those shellfish beds are likely to be reopened, officials say. The new facility will be built and operated by Kitsap Public Utility District, which owns and manages small water systems throughout the county. The Port Gamble plant will be the first wastewater operation to be managed by the KPUD, which views the project as a step toward reclaiming more of Kitsap County’s wastewater by putting it to beneficial use, said manager Bob Hunter. The PUD already manages the Port Gamble water system, which will undergo a future renovation, he said. Dealing with the community’s sewage is the next logical step. In a related development, the district is expected to ask Kitsap County voters for authority to own the plant as well as operate it. Under its current authority, the district can own water utilities but not sewer utilities. A $2-million state grant to eliminate the discharge of sewage into Hood Canal requires that a public entity own the sewer system. To comply with that requirement, Mason County PUD 1 will take over ownership until Kitsap PUD obtains the needed authority, Bob noted. The KPUD commissioners are expected to decide on Tuesday whether to place a measure on November’s ballot. Hunter said he doesn’t expect opposition, but he hopes to address any concerns people may have. The commissioners meet at 9:30 a.m. in their Poulsbo office. The new treatment plant will be a membrane bioreactor, a type of filtering system capable of producing effluent close to the quality of drinking water. The plant, which comes assembled, will treat up to 100,000 gallons of sewage per day. That’s enough capacity to serve the existing homes in Port Gamble. And if the town’s redevelopment is approved (Kitsap Sun, Jan. 24, 2013), as proposed by owner Pope Resources, the plant could serve up to 350 homes — provided the old sewer pipes are replaced to reduce the amount of stormwater that leaks in. The plant will be located on 1.3 acres near Carver Drive, south of Highway 104. Effluent will be pumped to a new drainfield at the top of a nearby hill. Eventually, water from the plant could be used to irrigate forestland or else lawns and ballfields in the town. Construction is expected to get underway soon, with the system operational by May of next year. The entire project, including the treatment plant, pumping system, pipes, drainfield and site work, is expected to cost $5 million with most of the cost paid by Pope Resources. The KPUD has no plans to operate other sewer systems at this time, Hunter said, but the district hopes to be in a position to respond to community needs, as it as done with failing water systems. 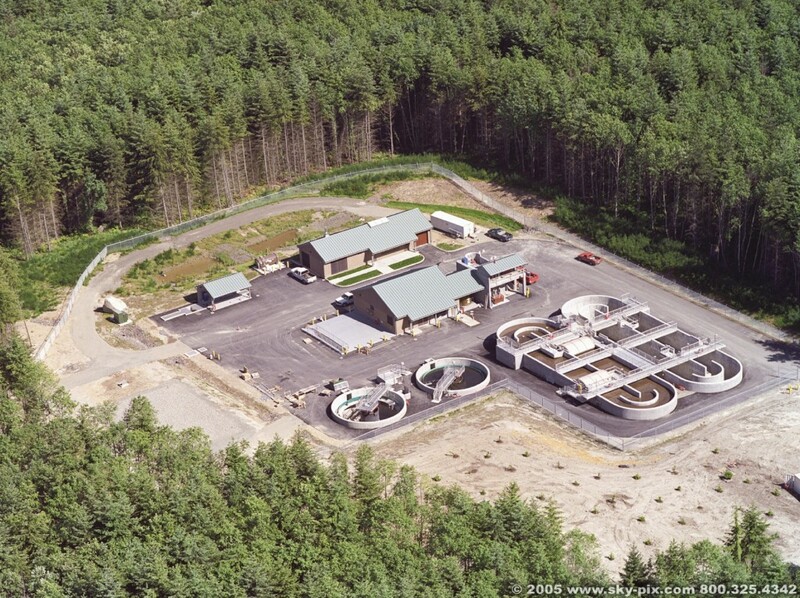 Small sewage-treatment plants could be feasible where a lot of septic systems are failing, he noted, but state law precludes the use of sewers in rural areas except during a health emergency. Even then, the systems must serve only existing needs, not future growth, he noted. Without snowpack, Kitsap Peninsula is entirely dependent on the amount of rain that falls on the peninsula. With limited storage, future water supplies can be bolstered by recharging the groundwater with high-quality sewage effluent or by using effluent to replace drinking water used for irrigation and industrial processes. 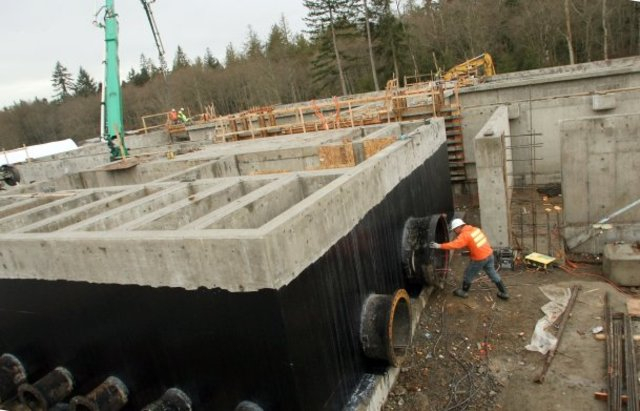 The Central Kitsap Wastewater Treatment Plant, which produces an average 3.2 million gallons of water each day, is undergoing a major upgrade to produce water that can be used for a variety of uses in nearby Silverdale. In preparation, Silverdale Water District has been installing a new piping network to bring the reclaimed water into the community. Washington Department of Ecology is poised to award $229 million in grants and loans for projects that will help clean up waters throughout the state. Grants to Kitsap County include $4.2 million for planned stormwater projects, plus another $4.6 million to lay sewer lines designed to protect shellfish beds in South Kitsap’s Yukon Harbor. This level of funding for a single round of water-quality grants demonstrates that elected officials are serious about cleaning up Puget Sound and other water bodies throughout the state. The Legislature must still approve the funding for the proposed grants and loans. The Yukon Harbor project is interesting, because Kitsap County officials were able to show that residents of the South Kitsap area would face a severe hardship if forced to pay for a new sewer line and all the connections themselves. Yukon Harbor has been the subject of pollution identification and correction projects by the Kitsap Public Health District. Fixing septic systems and cleaning up pollution from animals allowed 935 acres of shellfish beds to be reopened in 2008. See Kitsap Sun, Sept. 25, 2008. But recent studies show that the pollution is growing worse again as some systems continue to have problems. Officials say the best answer is to run a sewer line to properties on or near the beach. The grant will pay for the sewer line and pump station to carry sewage to the Manchester sewage treatment plant. Some money will be used to help residents pay for the costs of connections to their homes. Without the state grant, officials estimate that each of the 121 property owners would need to pay about $70,000 to complete the project, according to David Tucker of Kitsap County Public Works. Without the “severe hardship” grant, the project probably would not get done. One nice thing about this project is that residents will not be required to hook up to the sewer, Dave told me. Those who have upgraded or replaced their septic systems or have systems still working well may continue to use their own on-site systems. In addition to the $4.6 million grant, the county will receive a low-interest loan of $432,000 for the remainder of the $5 million needed for the project. Design is scheduled to begin this year, followed by construction in 2017 if things go well. Clear Creek project, known as Duwe’iq Stormwater Treatment Wetland, which will use a $937,000 grant to create a stormwater wetland off Silverdale Way near Ross Plaza to collect water from 18 acres of commercially developed property. Ridgetop Boulevard Green Streets project, which will use $1 million in a second phase of construction to create biofiltration systems in the median of Ridgetop Boulevard in Silverdale. Silverdale Way Regional Stormwater Facility project will use $1.5 million for new stormwater ponds north of Waaga Way to collect stormwater running off steep hills in the area. Chico and Dickerson creeks project will receive $500,000 to complete the second phase of a project to replace two culverts on David and Taylor roads and establish floodplains to take excess water during heavy rainstorms. Bay Shore Drive and Washington Avenue Filterra project will use $277,000 to install 15 Filterra planter-box stormwater filters to reduce pollution coming off streets in Old Town Silverdale. Kitsap County also was successful in obtaining a low-interest loan of $3.8 million to replace three aging pump stations and upgrade a sewer line on the beach near Manchester. Since the line is part of the Manchester system, the loan will be repaid through sewer fees. In all, Ecology received 227 applications requesting more than $352 million in grants and loans. Some $143 million went into loans, and $21 million went into grants allocated to 165 projects statewide. About 110 of the projects involve stormwater pollution. A public meeting on all the projects will be held at 1 p.m. March 4 at Pierce County Library, 3005 112th St. E., Tacoma. Comments will be taken until March 15. For information and a list projects, check Ecology’s website. Are you ready to water the lawn with treated sewage? It seems as if it has taken forever for someone in Kitsap County to put treated sewage to beneficial use, but a demonstration project on Retsil Road in South Kitsap is just around the corner. Check out my story in Saturday’s Kitsap Sun. 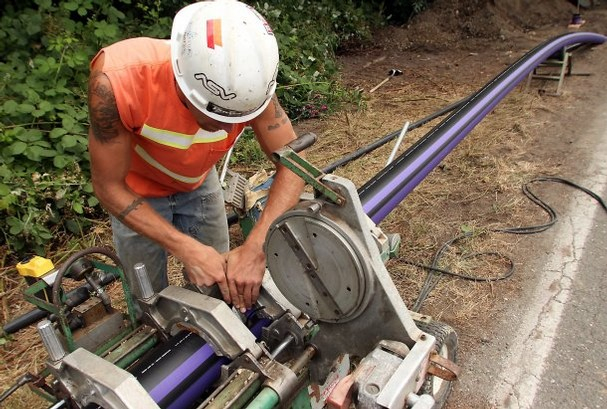 Darren Noon of Pape and Sons Construction Co. welds a section of "purple pipe" along Retsil Road in South Kitsap, the first reclaimed water project in Kitsap County. Local water experts were contemplating uses for highly treated wastewater even before “low-impact development” became a common phrase for infiltrating stormwater into the ground. LID has caught on fairly quickly as a method of keeping polluted stormwater from reaching our streams and Puget Sound. The concept got an extra push from new stormwater regulations, which have greatly increased the cost of conventional pipe-and-pond methods of stormwater management. The less-touted benefit of LID is groundwater recharge, which boosts our long-range water supply. 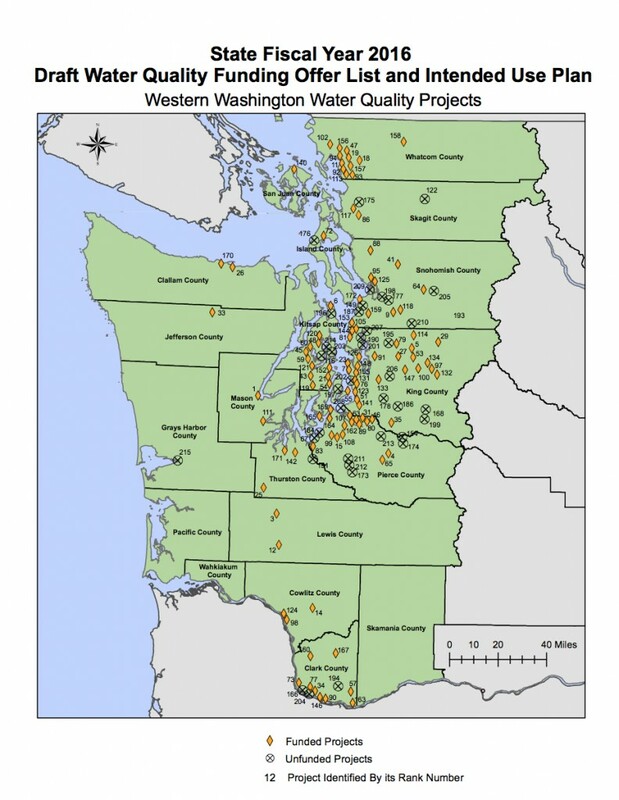 Kitsap County’s Watershed Management Plan (PDF 147 kb), developed in 2005, estimated that Kitsap County’s sewage treatment plants release 8 million gallons of treated water into Puget Sound each day. That’s enough to increase the base flow of 10 streams by 10 cubic feet per second, raise aquifer levels throughout the county or launch a new industry without touching our drinking water supplies. The report mentions that highly treated effluent from the Central Kitsap Wastewater Treatment Plant near Brownsville could be used to supplement streamflows in nearby Steele Creek. But more recently Kitsap County and Silverdale Water District have begun working together on a plan to pipe the water into the heart of Silverdale, where it can be used to water ballfields and landscaping. That’s also the initial plan put forth by West Sound Utility District, as I mentioned in Saturday’s story. Using wastewater for irrigation cuts down on peak demand, which is what drives water utilities to drill new wells. Needless to say, drilling deep wells comes at a tremendous expense — an expense that grows greater as Kitsap County approaches the limits of its groundwater supplies in some locations. To many people, using reclaimed wastewater seems like a novel idea, especially in an region known for its rain. People remain squeamish about getting anywhere near sewage water, even if it is treated. But I don’t believe it will take long for people to accept the idea of using treated wastewater for irrigation, once they realize it is treated to basically the same level as drinking water. On the other hand, drinking treated effluent becomes another issue, even though it has been done indirectly for years in many places. If you live in a town on the Mississippi River, your local utility may be drawing water out of the river for your consumption just downstream of where a sewage treatment plant is dumping its effluent. There are several other places where reclaimed water is mixed with freshwater, such as in a reservoir, then drawn back out for drinking. Ironically, putting the wastewater into a reservoir makes it seem more palatable, even though it probably was cleaner before. Treating the water in the reservoir is essentially treating the wastewater again — although water is just water in the end. For a description of reclaimed water systems in the U.S. and elsewhere in the world, check out a fact sheet compiled by Queensland Water Commission, Australia: “Water recycling: Examples from other countries” (PDF 592 kb). A community in Texas made news across the country last week, when reporter Angela Brown of the Associated Press wrote about a new $13-million water-reclamation plant to turn effluent into drinking water, the first to be built in that state. Really, it is nothing new, as Angela herself points out. What I have not found anywhere so far is a direct use of reclaimed water. That’s what you would get by pumping the highly treated wastewater directly into a municipal water system’s piping network. From a health standpoint, there would be nothing wrong with that, provided the water could be shut off in the event of a problem at the treatment plant. No doubt this kind of direct use will be a little harder to get used to, even in areas where water is scarce.